OUR BEIJING OFFICE is ideally located in the Central Business District. It is known as the CBD and seems to be under constant construction with skyscrapers popping up like mushrooms. Because of the concentration of Fortune 500 companies nearby the intersection of two major roads, Jianguomenwai Avenue and Dongshanhuan, this area is often referred to as "The Golden Cross." Quickest visual orientation for you is: Tiananmen Square is at the foot of the cross, the World Trade Center at the cross-beam heart, and Cyber Import in the northern, right hand of the cross. 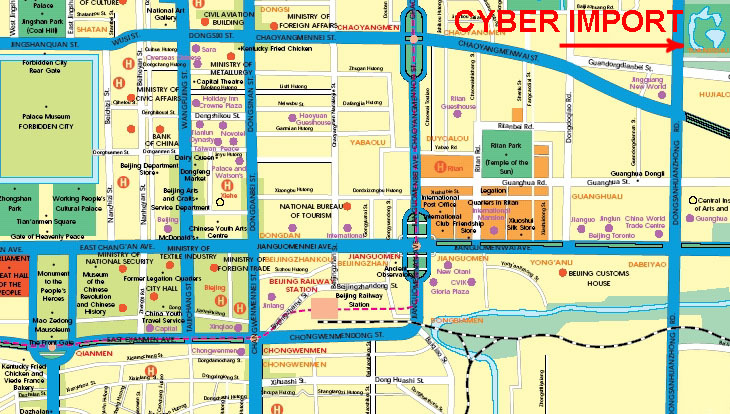 Use this Map of central Beijing to get your bearings from Tiananmen Square to Cyber Import, and everything in between. 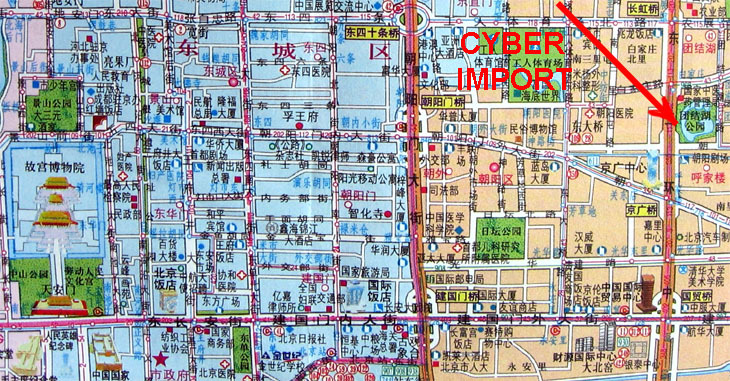 This is a good map to print out and give to your taxi driver for a ride to Cyber Import on the Golden Cross. 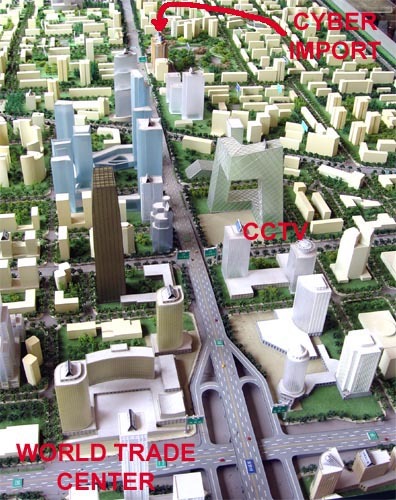 This real estate scale model depiction shows the Golden Cross after current buildings are completed. The area will include the architectural marvel of the CCTV building, the tallest building in Beijing, and other multi-tower business centers. All are walking distance from the World Trade Center, and to Cyber Import in the Bauhinia Court. One of the above maps should work well. 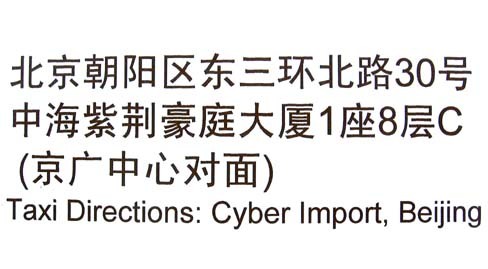 For your convenience, this .jpg image in Chinese is a directional note to be given a taxi driver. The download is about 49K. Check out the pictures of our building on the Contact Us Photo page. You will then be indestructible for the transit adventure and easily identify your successful arrival.